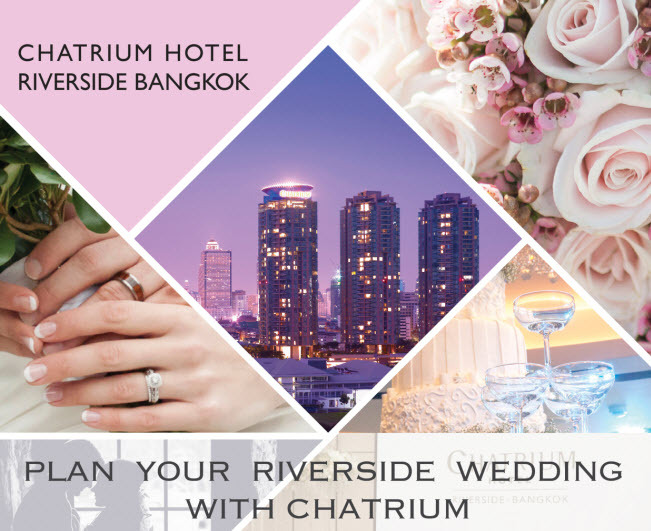 Come join forces with our team of expert wedding planners to make your dreams come true at the Wedding Fair 2018, 31 March and 1 April from 10 am to 8 pm in the Chatrium Ballroom on the 4th floor of the Chatrium Hotel Riverside Bangkok. Future couples spending a minimum of Baht 300,000 net will be awarded the privilege of a 10% discount on total food and beverage expenses, and further privileges are offered to those who spend more. The riverside charm of our expansive new ballroom will offer up a magical wedding, and simplify your lives ahead of the big day. All the little details that make up a captivating wedding can be dealt with in one place, as guests at the Wedding Fair 2018 will have access to jewellery vendors, wedding studios, wedding cards and much, much more. Our concept is a minimalist theme representing simple, classic luxury, with a color scheme of lavender, lilac and silver interwoven with green leaves. The Wedding Fair 2018 will give you a chance see how our vision can be realized, and to discuss with our wedding planners how you might personalize plans for the special day with and your special someone. Luxurious scenes in soft, sensuous pastels will accentuate our captivating riverside charm and bring your wedding to life! Next PostNext Handily Embrace Iconic Living At Emporium Suites by Chatrium!